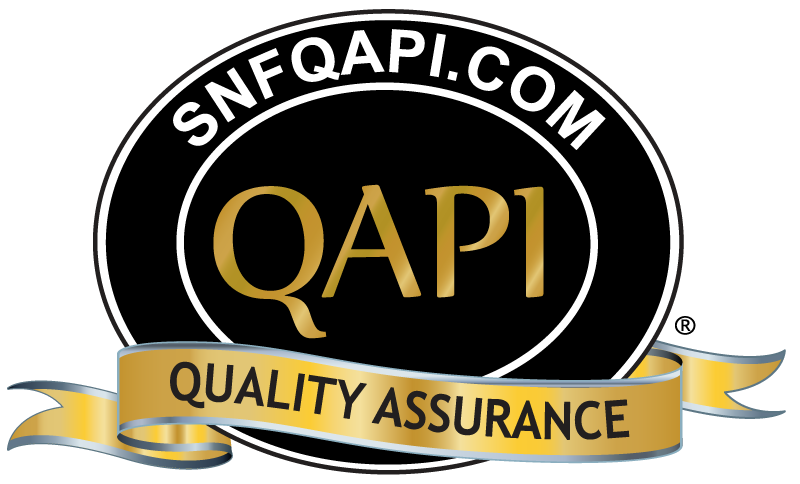 A QAPI program must be ongoing and comprehensive, dealing with the full range of services offered by the facility, including the full range of departments. 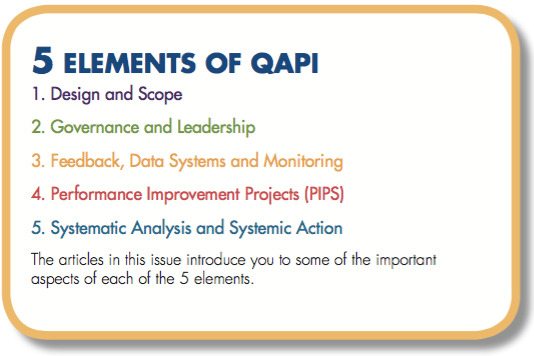 When fully implemented, the QAPI program should address all systems of care and management practices, and should always include clinical care, quality of life, and resident choice. It aims for safety and high quality with all clinical interventions while emphasizing autonomy and choice in daily life for residents (or resident’s agents). It utilizes the best available evidence to define and measure goals. 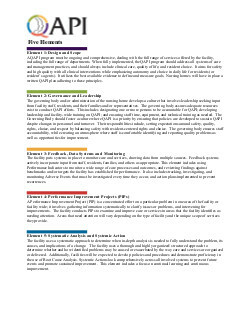 Nursing homes will have in place a written QAPI plan adhering to these principles. 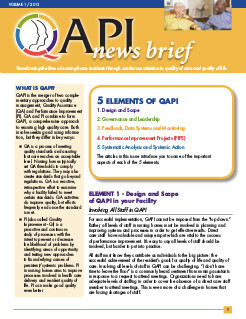 For successful implementation, QAPI cannot be imposed from the “top down.” Rather, all levels of staff in nursing homes must be involved in planning and improving systems and processes in order to get effective results. Direct care staff have valuable and unique input which are vital to the success of performance improvement. It’s easy to say all levels of staff should be involved, but harder to put into practice. All staff must know they contribute as individuals to the big picture: the successful achievement of the resident’s goals for quality of life and quality of care. 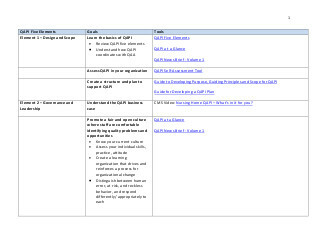 Involving all levels of staff in QAPI can be challenging. “I don’t have time to leave the floor” is a commonly heard sentiment from nursing assistants in response to a request to attend meetings. Organizations need to have adequate levels of staffing in order to cover the absence of a direct care staff member to attend meetings. This is even more of a challenge in homes that are facing shortages of staff. Nursing assistants may not be accustomed to voicing their opinions in the company of directors, supervisors, physicians, and other senior nursing home staff. Let direct care staff know that their experiences with the residents are invaluable to the QAPI process. Their hands-on knowledge of the resident and the day-to-day processes of the nursing home are necessary to the QAPI discussion and planning.